Why Your Business Needs Entrance Mats | Ace Uniform Services, Inc.
Give Ace Uniform a call if you are thinking about getting mats for your establishment. Are you a business owner? If you are, does your building have entrance mats? Believe it or not, a simple entrance mat can benefit your business on many levels! However, for whatever reason, many companies decide not to have them or just treat them as an afterthought. A standard floor mat is not a major expense but should go a long way. Here are a few reasons why your business needs entrance mats! Do you know the saying, “first impressions are everything.” Business owners can benefit from following this mentality. Customers and clients are going to assess your business when they first walk through your doors. A welcoming entrance mat should provide your customers with a good first impression of your business because it will be one of the first things they see. Slips, trips, and falls occur more often than many people realize. In most cases, these accidents occur from moisture, dirt, and other forms of debris on the person’s shoes. By having an entrance mat, customers and clients have the opportunity to wipe their feet before they enter your establishment. You can even go one step further and put up a “Please wipe your feet before entering” sign on your front doors as well. In most cases, the front door of an establishment is a high-traffic area. If people are constantly coming in and out of your building, dirt on your floors is inevitable. 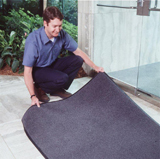 However, an entrance mat should cut down the amount of dirt and debris that would otherwise be brought inside. There are only so many that you can protect the floors of your business. Investing in an entrance mat is one of the best protective measures you can make for your floors. This entry was posted on Friday, October 27th, 2017	at 3:14 pm	. You can follow any responses to this entry through the RSS 2.0	feed. Both comments and pings are currently closed.